Escape From Black Friday 2014 - No, really. As usual, click on any of the pictures for a larger view. No, no, we didn't really go to China. I lied a little bit. Mostly to see who would be the first to recognize where we REALLY went, and the honor for that went, not surprisingly, to the honorable and most sagacious Tugster, who called my bluff over on Facebook within about five minutes. "China on Staten Island?" he said. "No! No! China! We're in China!" I protested, and he humored me with a "oh...wink wink...yes China...where the scholars are...". He was correct, of course, the distant pagoda-roofed pavilion I posted yesterday was actually in the Chinese Scholar's Garden at the Snug Harbor Cultural Center and Botanical Garden in Staten Island. We usually Escape from Black Friday with a hike or a paddle, since on the day after Thanksgiving TQ and I like to work off the turkey. Before TQ and I started dating I used to do Paddle Off the Turkey Paddles; after we started dating we'd frequently visit his folks for Thanksgiving and since there's some good hiking near them, I un-stuck myself from the idea that I absolutely had to paddle on Black Friday, and we've had some fine hikes since then, enjoying being outside and active while so many poor suckers are fighting for whatever the year's big doohickey is. This year dinner was early enough that we decided to make a day trip of it and although I did know that the madness has actually moved to Thanksgiving night, we both gasped in horror when we stopped at a stoplight by a Best Buy and looked over to see this queue of people all lined up outside and being let in one by one by some poor gatekeeper. Sheesh. Anyways, this year it was a bit windy to escape by boat, and TQ has had a cold that's hung on for about a week, so he wasn't quite at his usual energy level. Somehow this year I've been hearing so much about the Noble Maritime Collection - Noble's art is featured in Tugster's terrific documentary Graves of Arthur Kill (great stocking stuffer for the working harbor enthusiast, btw! ), and more recently, Richard Spilman of the Old Salt Blog had spoken about the collection during a sea shanty presentation he gave recently. I'm actually planning to go to the shanty sing on the 21st, but I figured with TQ under the weather, a visit to just see the collection would be a nice alternative to our usual Black Friday adventures. I was ready to go on my own if he didn't feel like it (then I would've gotten to Escape from Black Friday via the Staten Island Ferry, which would've been absolutely fine, I love riding the ferry) but he though it sounded like a good idea too, so that's what we did. Visitor's Center - go away. not here today. website? what website? We were disappointed to find the Snug Harbor Visitors Center and all of the gardens were closed, despite the website making no mention of it - there was actually a sign on the visitors center door saying that they would be closed on Thanksgiving and open Friday, Saturday and Sunday, but somebody had scribbled out Friday with a pen. Fortunately the grounds were still open, and we started with a nice walk around. Captain Robert Richard Randall, who willed his property to found the Sailors' Snug Harbor. The original property was in Manhattan, just north of Washington Square Park, but even in those days real estate was real estate and the trustees decided to build rental properties on the original estate and use the proceeds to fund the purchase of 160 acres in Staten Island, where the home was finally built. I'd been here once before to see a concert, but the friend with whom I went that time and I did not walk around much, so I didn't realize how extensive the grounds were. Certainly didn't know they had a farm here! Have to come back sometime in the summer when the fountains are running. After a good ramble, we headed on to the destination du jour, the Noble Maritime Collection. Fortunately these guys WERE open, the grounds were nice but I would've been pretty bummed out if TQ had shelled out thirty bucks in bridge tolls to look at landscaping. With these guys open, it was definitely worth the trip. The collection is extensive, with three floors (at least) of all sorts of things to look at. The docents suggested that we begin with the houseboat studio of John A. Noble, the artist after whom the collection is named. I'd seen this in Graves of Arthur Kill and it was fun to see it in person. Noble worked as a seaman for many years, painting and drawing as he did so, eventually becoming a full-time artist in 1946. At that time, wooden ships were rapidly becoming obsolete, and the world's largest ship's graveyard was in Port Johnston, NJ - according to the collection's biography, from which I'm borrowing all of this info, he first saw it in 1928, and was captivated by the place. In 1941, he began cobbling together a studio, building onto the deckhouse of an old yacht. As described in the exhibit at the collection, if I'm recalling correctly, the studio became a floating studio when the piers began to shut down - most of us urban boaters can relate to that horrible feeling of losing your water access; he responded by moving his studio onto a barge so that he could float it away. The biography I linked to above includes a short slideshow including a drawing by Noble of his studio and a photo of the studio at the ships' graveyard, with Noble aboard. The collection also features a number of his paintings and drawings - I think my favorite was a set of three from his Schooner's Progress series, following a schooner that he had worked on for some time and was therefore very familiar with, from building to boneyard. I wish I'd noted the name. The three that the collection has show her new, with sails unfurled to dry after a rain; older and underway, and then scuttled in the scrapyard. Haunting. "Means of support if not accepted at Snug Harbor?" A restored Snug Harbor dorm room. Sailors who were able were expected to work, but for a sailor who could otherwise expect an end "in a cold hallway", to grab another phrase that stuck in my head, this place had to feel like heaven. Portum Petimus Fessi: "We who are weary seek a harbor". Snug Harbor's motto. so many model ships - I loved this one with the lighthouse and the tug! and new - very new! NYC residents - look closely at this wonderful miniature by Patrizia Vignola - see what she used as a "canvas"? That shape should be pretty familiar! :D Answer at the link if you can't guess. Barometers, an octant, and a small light such as might be placed to mark a small obstruction in a harbor, all on display in the navigation classroom. Heading out shortly before 4 - moon rising behind the Music Building. Looking forward to my next visit, I'll be back in December with a few friends for the monthly William Main Doerflinger Shanty Sing (12/21, 2 to 5 pm). Fingers crossed that maybe the gardens will be open this time - I wouldn't even mind if there was snow, I think the Scholar's Garden would be beautiful in the snow. I leave you with The Old Salt's video of a May 2011 sing. HA HA HA they'll never find us here in CHINA. Same as he does every year. Someday I should reload my animation software, but for now, he'll have to do (and I still think he's cute). Happy Thanksgiving! Ticked Off Turkey! from Bonnie on Vimeo. Chiclet - PortSide NewYork Ship's Cat and Chief Supervisor. Hi Chiclet! More pix from the day on Flickr (click here). Hooray, I'm on vacation this week! I'm hoping to get at least one good paddle in, plus our annual Escape from Black Friday. Today it's drizzly and a good day for the final stage of making pozole (this is antithesis of fast food, in fact it's the slowest food I've ever made), but yesterday was absolutely gorgeous and with last week having been a profoundly sedentary one as I wrapped things up for my week off, I was ready for some outdoor activity. Could've gone paddling, of course, but instead I decided to go help out Carolina and company at PortSide NewYork on board retired tanker Mary A. Whalen. Yesterday was the last official day of a project Carolina has dubbed "The Big Schlep" - PortSide has amassed a fairly good-sized collection of artifacts from various old Red Hook maritime businesses; until recently they'd been stored in the piershed in the Red Hook Container Port where the Mary Whalen has resided for the last few years, but this Fall it became time move the collection on board the tanker. Two reasons - partly to make room for a new port tenant, and partly (better reason) because as Carolina announced at their fundraiser earlier in the fall, there has been real progress towards a long-term, publicly accessible home for the Mary A. Whalen in Atlantic Basin. It's not set in stone yet but it was wonderful news to hear - the handsome old tanker should be a significant tool in the organization's work "to create better use, understanding and enjoyment of the waterfront...and to create thematically-related programs that revitalize our home neighborhood" (from their mission statement) -- open to the public, with her holds housing exhibits on our waterfront's history, and some of the organization's programs held right there on board, but for the last few years she's been parked in the Red Hook Terminal, which is a MARSEC ("maritime security") facility, considered sensitive to attack and therefore with carefully controlled access. Workers at the port, like workers at similar facilities all over the country, are required to have a TWIC (Transportation Worker Identification Credential) card to enter; Carolina and the rest of the PortSide staff have cards and each one of them can bring in a certain number of uncredentialed people, but it's a limited number and the non-TWIC folks need to be physically escorted by a TWIC card holder at all times while in the facility. I'm glad that the Mary A. Whalen had someplace to stay at all while PortSide NewYork worked on finding a publicly accessible space for her, and of course the organization kept things going without that (in fact they won a White House award for their role in Red Hook's Sandy recovery, that area was hit horribly and they did a tremendous job of helping the whole area get things back together - Carolina, the founder, is a great organizer and advocate and has some good like-minded people working with her), but I think all of PortSide NewYork's friends and supporters are looking forward to the day when the organization can resume regular public programming aboard the tanker, as they used to have before the move to the container port (and as they've still occasionally had during the times they've had temporary permission to move the boat to a more public pier). Bit of a digression, but I didn't have a whole lot to say about the work day itself except that it was just the fresh air and physical work I was looking for after a long cubicle-bound week - head on over to the Flickr album I linked to at the top of this post for more on the work day itself. I did have a great time helping Peter, who is a professional rigger, working in television, move some REALLY BIG PISTONS - I don't know how much they weighed but somebody said more than a car engine - maybe 300 pounds? And they had to go down the companionway, through the "fidley" ("A partially raised deck over the engine and boiler rooms, usually around the smokestack" - ever need a nautical term defined? Check here! ), around a corner, down through the deck grating, into the engine room and finally over to their temporary storage spots alongside the engines. That was a novel experience and a lot of fun - we used a pair of half-ton manual chainfall hoists and it was neat seeing how it worked. The move of first piston took some thinking as we figured out what path it needed to follow (and Peter ended up drilling a hole in one of the deck beams for the last move down to beside the engine, which was a slow and painful job) - the second one, I think we did the moves in about a third of the time. All in all, another good day on the water! Told you so! Beets and herbs are from the garden, the rest purchased for my Big Vacation Cooking Project - Pig Head Pozole. This is actually a 2-day process, I'm on Phase 1 today - dutch oven's been put through its paces, started with veggie roasting (the beets aren't going in the pozole but everything else will) and then moved on to a long slow simmer of the pig head (from the Sebago pig roast earlier in the year, didn't want the head to go to waste so I brought it home, wrapped it well and put it in the freezer) and a couple of pernil bones. Blow by blow account over on Facebook, but I'll collect and repost over here when it's done. Today is simmering. Monday's supposed to be rainy. I won't mind if it is, that would be perfect weather for messing around with chile-roasting and the other finishing touches. Ah, it's rewarding to have some summer-grown greens and pesto stashed in the freezer for the winter. As always, it makes me appreciate that I don't have to grow and preserve food to survive - much nicer to do it for fun. What, you were expecting Disney, maybe? Ha. Movie, schmovie. Tomorrow - The Sequel: Roasted! It's Freezing, And So Am I! Chard and beet greens tonight. More photos on Flickr - click here to view. Third visit to Gotham Archery, this time for the Mockingjay promo day, which was of interest to me since I work for the publisher of the Hunger Games trilogy and we all get pretty excited when the movies come out. Gotham Archery has been getting fantastic Yelp reviews, and when Lionsgate, the movie company, went looking for an NYC archery range to host a Mockingjay promotional event, they picked the guys at Gotham. Ken, one of the owners and the instructor of my intro class, had mentioned this when he was talking to Iris (Sebago clubmate who got me started into this with her Facebook posts about taking up archery) and me after my class a couple of weeks ago - I'd been toying with the idea of going but was still a little up in the air, but when Iris said, "Anybody want to go? ", I said "Me me me". This time I couldn't resist taking a camera! TQ, Iris, another paddling friend and I all went and had a very good time. I was a little disappointed nobody dressed up (pictures of people in costumes would've been fun) but everybody was having a good time, there were prizes for everyone (a pin or a poster plus a shot at a gift bag) - and at the end, the guy from Lionsgate fell in love with Iris and set up a whole photoshoot with her! I think I'll stick with the quieter weeknights for my practice sessions now, but this was a lot of fun. Last week. Thought about shutting it down on Sunday but TQ's finally got weekends free and he'd proposed a walk at Fort Tilden on the Rockaway Peninsula. I checked the forecast - no hard freezes so decided on the Fort Tilden trip instead (unfortunately no camera but it was a lovely day out there). Scotch bonnet peppers went totally crazy here at the end of the season, and they were nice and spicy too! This week, we've got a hard freeze forecasted for Tuesday night, supposed to get down in the 20's, so it was time to shut it down. TQ came to help and we finished it quickly. I brought home chard, beets, peppers, green tomatoes and some herbs, 3 bags full. TQ and I will have some of those for dinner tonight & hopefully this week is quiet enough at work that I can come home and do some freezing. Nice to have a few home-grown veggies for the winter. Might have to try pickling some beets, too, there were a lot of those! Wasn't my best garden year ever but still not too bad. What an interesting evening at the North Brooklyn Boat Club. It was an odd mix of fun and troubling. The troubling part was the nature of Dan and Amy's mission. I think everyone there last night, and in fact most serious paddlers (especially canoe paddlers) had heard of the Boundary Waters Canoe Area (BWCA). In fact I think the gang last night divided neatly into two groups: those who'd been there, and those who hadn't been but think it would be neat to go. Unfortunately there are mining companies who also think it would be neat to go, and if they get their wish, they'll be gambling with the very cleanliness that makes the area such a draw for paddlers from all over. Very sad. Mark Twain describes some ridiculous scenarios of miners staking claims in the middle of towns with zero regard to property owners during the California gold rush in Roughing It -- mineral rights superseded all prior claims, and I was reminded of those stories as Dan and Amy talked about survey drilling being done all over an Outward Bound camp near where they live and work. Dan and Amy are wilderness guides who make their living introducing others to the Boundary Waters. If I've got the story right (they told it last night but I was momentarily distracted by one of the two sweet dogs that were there) the trip came about when Save the Boundary Waters came up with the idea of converting a large canoe to the most vivid petition imaginable. 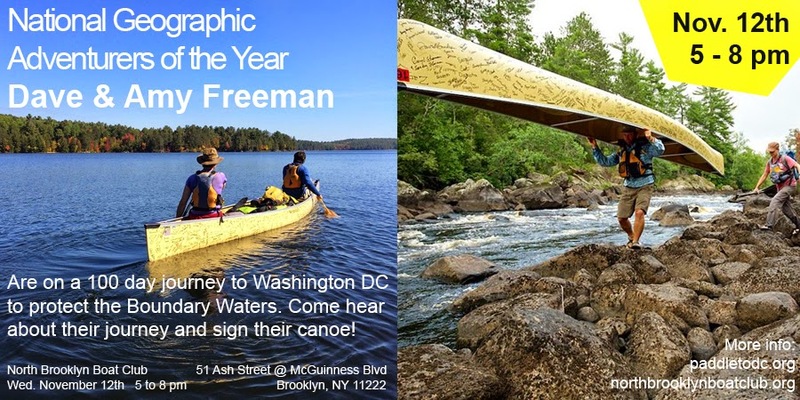 There was some discussion of how to get the canoe to DC (ideally they wanted to present it to Obama, but last night Amy said they'd be presenting it to the Secretary of the Interior instead) and at some point Dave and Amy realized that the most impressive way to get it there would actually be to paddle it there, collecting signatures and spreading the word as they go. Brilliant idea, I knew nothing about these plans. I love paddling but I don't tend to read Canoe and Kayak or any of the publications where the proposed mines would have been covered; the last 2 BWCA news items I recall were about a huge storm that leveled a huge swath of forest a few years ago, and another about some idiots who decided that it would be fun to go terrorize BWCA campers. Nothing about mines that could destroy the area forever. I was happy to sign the canoe. We were treated to the world premier screening of Paddle to DC: A Quest for Clean Water, a short documentary about the project. It really seemed somehow fitting that the first screening was being held on the shore of Newtown Creek, one of NYC's most notorious Superfund sites. As one of our hosts said after the film, nodding sadly towards their beloved but deeply befouled creek, "Once you've lost it, you can't get it back". BTW, if you missed them at the North Brooklyn Boat Club, there is one more chance to meet them and sign the canoe er petition - they'll be at Columbia University on Tuesday, 11/18. 8 PM, Hamilton Hall, 1130 Amsterdam Avenue, free and open to the public. Hosted by Columbia University Divest Climate Justice. Can't make that but want to sign on? Of COURSE there's an online version. Not as much fun as signing a boat but still valid, click here for that. And now to the truly fun part - it was great finally seeing this place! I've seen pictures and videos and just based on those, if we had to pick a boat club to win an Urbanest of the Urban award, I seriously think the North Brooklyn Boat Club wins (and that's not just because the kielbasa pasta was delicious, which it was, Greenpoint's an old Polish neighborhood and the club shopped local). As I said yesterday, this was my first view. I was crossing the creek on the Pulaski Bridge and since I'd already gotten turned around coming out of the subway and making a detour before getting myself properly oriented, I was running a bit late and was worried about finding the place. Then I looked down. Ah, no more worries! There's an enclosed shop area at the front, where they do boatbuilding and restoration. Here's a lovely old boat awaiting some NBBC TLC. Amy, fellow guests, and the famous petition. Love the graffiti! Gathered around the firepit. The weather was good but it is November and the fire was a good thing. My signature - couldn't resist adding the blog name! Cozy dog. There were two pups in attendance, both very sweet. This one thinks it's past her bedtime. Looking down Newtown Creek towards Manhattan. So pretty, but so polluted. John and Steve show off the bumper stickers Amy and Dave brought with them all the way from Ely. Checking out the club's ecology exhibits on the way out. Very neat, this place. Good luck to Amy and Dave, I hope your message is heard! It ended up not being a terribly late evening and I did think about going ahead and doing a writeup tonight, but there were a couple of things I needed to take care of first and I didn't get going early enough - I do need to get a reasonable amount of sleep tonight and I suspect my report of tonight's fun is going to be one of those posts that ends up taking a lot longer than it should (for starters it's going to be picture-heavy and photos take time to upload). I'll circle back to that in a day or two! However, I'd also been wanting to jot down some notes from my Monday night return to Gotham Archery; I went back for a practice session so that I wouldn't forget what I'd learned the week before, and ended up getting a lot of good suggestions that I want to keep in mind for my NEXT practice session (yes, there will be another one, I'm still not a great shot but I'm still enjoying it). I'd mentioned that I was going on Facebook and said something about updating my profile shot with the new target if it showed any improvement; earlier today a friend asked if I'd done that and I went ahead and posted it and also did a quick writeup with those things I wanted to remember. Figured I'd post it here too. Unfortunately I'm not sure it shows progress as much as just sheer dogged patience in the face of my own mediocrity. But then that's how I got to be a good kayaker, so I'm not particularly frustrated. Although I'd only paid for practice time, the instructors were stopping by my lane occasionally to check out what I was doing and give me hints. -Hold the bow vertically while loading (this is out of consideration to your neighbor, the lanes are very close together). -Turn my head completely to look at the target (I got into this thing of looking at it out of the corner of my eye - I also noticed I was tending to rotate my torso towards the target instead of keeping my shoulders perpendicular to the line - good grief, if there's one thing I should be in control of it's torso rotation). -Don't rush. Draw, settle (one, two, three), shoot. -Fingers open on the bowstring, don't pinch the end of the arrow between the index and middle fingers. It's nocked on the string, it will stay. Pinching it just disturbs the flight. -The drawing hand should come straight back to touch the face. -Further to the drawing - Work on draw consistency - one of the instructors noticed that my hand landed on a slightly different spot each time (probably overdrawn as that was what I was doing in the intro class). Index fingernail to right corner of mouth. Why is this so hard? -Release. I was just opening my fingers but there should be a little more energy to it - the hand sort of flies back. I don't understand why this makes a difference but it did. -And nobody told me this, but CONCENTRATE. I had this thing going on where I would get one good shot, and then the next shot would be close to that one, and so would the next one, and then the next one would just be whacky and I would realize that I hadn't thought through the steps. I really have to do this little mental checklist thing to get it to work and whackiness happens when I don't. So then I would slow myself down and think the next shot through and it would be better. Not sure why, but they'd decided at the beginning of my session that I wasn't going to be on the clock this time, and I worked on it for over two hours, which was the point at which my arms were near falling off. I kept at it until I finally got a nice tight grouping with all five of my arrows in the center of the target and close together, then decided to stop on a good note. Next practice session will tell whether that was just luck, or whether things are sinking in. Sorry for the lack of advance notice, this one totally snuck up on me. Dave and Amy Freeman have a petition to protect the Boundary Waters (an area I've never visited but would like to someday, it sounds amazing) and they are paddling their petition (which you might mistake for a nice Wenonah canoe if you didn't know that it is in fact a petition) to Washington DC, collecting signatures as they go. They started in Ely, Minnesota on August 24th, and they'll be at the North Brooklyn Boat Club tonight from 5 to 8, with the presentation expected to start around 6:30. Should be fun! 11/13 update - Hey, if you missed the NBBC event, there's another chance to meet them, hear their story and sign the canoe-shaped petition - they'll be at Columbia University on Tuesday, 11/18. 8 PM, Hamilton Hall, 1130 Amsterdam Avenue, free and open to the public. Hosted by Columbia University Divest Climate Justice. Click here to learn more about the Freeman's adventure. We had beautiful weather for Fall work days at the club this weekend. We do work days a couple of times during the year; generally there are a couple to get the grounds and the fleet up and running for the season in the spring, and a couple more during the fall to put things to bed for the coming cold season. The club has a very reasonable work requirement of 15 hours for each member and working a couple of these workdays is a fun and very helpful way to fulfiill that requirement. I'd actually worked well past the required hours, but everything I did was for the sea kayak committee and the first of the work day calls was actually from the Sailing Committee. Between other commitments and bad weather, I missed the Fall race series this year, but I did get out for some very nice cruises and I think that if I play with the dinghies I should help take care of them. A few days after the Sailing Committee workday was announced, Saturday and Sunday all-club workdays were also announced, so it was a good, productive, busy weekend (with pizza even!) at our grounds in Canarsie. John W. gets the mowers ready. John's amazing, he does a huge amount of work at the club just on his own time, and is also very good at organizing these work days so that the many hands that show up are actually used in the most efficient way possible. The thank-you note that another member posted to the club's Yahoo group after John posted a wrap-up of the remaining work to be done described him perfectly as "The spark plug that keeps the Sebago motor purring like a kitten!" Sunfish Blue being checked for leaks. A soapy sponge is run along all the seams and fittings, then they use the shop-vac to run air into the hull. Soap bubbles get blown at any leaks. Word at the end of the day were that there weren't as many as there have been sometimes. Those that were found were or will be patched. Bob and Lynn and I took care of Sunfish sail maintenance, cleaning, oiling the moving joints on the goosenecks, replacing rings and fasteners that had disappeared over the season, checking for wear and tear, all that good stuff. I also found a permanent marker and wrote over the measurements and names that are written on each rig. You might say my work was remarkable. Garden committee members discussing plans. A few energetic members spent part of the day splitting firewood for the stove which serves as the main source of heat in the clubhouse in the winter. Garden committee cleaning up the fenceline. I also benefit from the gardens and hadn't done much to help out with the maintenance of the various plantings around the grounds that is the responsibility of the garden committee, so I was happy to have enough time left after the sail work to at least put in a few of the plants that a new member had been able to bring. End of a good productive day (and then they had another one on Sunday). Bring on the winter!